For bus with Wi-Fi only. Assumes registrant has own theater ticket. Note: Member ($66) with guest ($81) will cost a total of $147. TO ADD YOUR GUEST: click on the "ADD GUEST" button at the bottom of the registration form and enter the guest information as indicated. Thank you. Join us Tuesday, August 14th, for our second American Players Theatre (APT) play of the summer, Born Yesterday, by Garson Kanin. For more information on the play, see APT's Born Yesterday website. 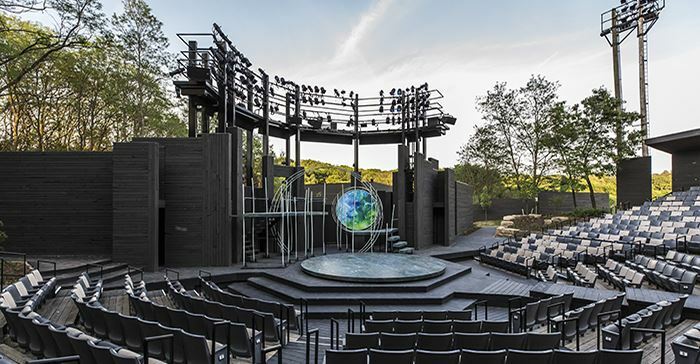 Born Yesterday will be staged in APT's flagship outdoor Hill Theatre, a natural amphitheater with 1,088 cushioned seats. It is about a quarter-mile walk (or shuttle ride) from the parking lot to the theater. Our seats will be in the "Very Fine" Section 6 and close to the stage. More information about this theater and how to prepare for your visit, including rain policy. Enjoy the group dinner at Arthur's Supper Club in Spring Green. The bus will drop you off at 4:45 pm and pick you up at 6:30 pm. Pack and enjoy a dinner from home on the APT grounds. Order/Purchase/Pick Up (on your own) an APT Box Dinner by Hubbard Avenue Diner to be picked up at the concessions stand in the picnic area starting two hours before the performance. (See Picnics by Hubbard Avenue Diner for details.) Please note, picnics must be ordered in advance by the day before your performance, no later than 4:00 pm. *Group Dinner Option is available to those who want to register, but may be hesitant...not knowing anyone and uncomfortable eating alone. The group option dinner addresses this concern and is a good way to make new theater trip friends. Just answer "Yes" to Group Dinner questions on the registration form and we will take care of the rest. 10:10 PM Born Yesterday performance ends. Begin bus boarding for return to Madison. There will be adequate time for walking/shuttle down the hill and restroom use.